There is a need to transfer playlist from a device to another if there is a loss of playlist due to a fatal computer crash. Getting back this playlist file from apple store could cost a lot buying. Luckily, all that is needed to be done is to copy playlist from the iPod to iTunes on your PC. 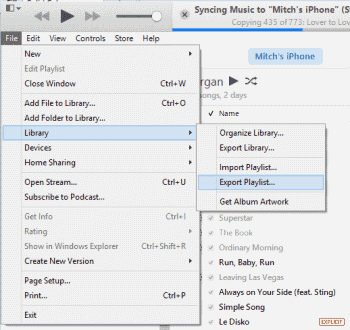 Part 1: How to Copy Playlist from iPod to iTunes without Losing Data? Part 2: How to Copy Playlist from iPod to iTunes on Computer? Part 3: How to Copy Playlist from iPod to iTunes Using iTunes? If you are looking for the fast and easiest way to transfer playlist from iPod to iTunes without losing data, you could seek help from iMyFone TunesMate, which is a transfer media that assists you to transfer all kinds of data between iOS and iTunes/PC seamlessly. Step 1: Download and install iMyFone TunesMate on your PC or device, connect your iPod to software. Step 2: Select the “Music” tab, wait for a short period for your music files to refresh and fill the screen. Then click on the playlist file you wish to export. Step 3: Click “Export”. Then click "Export to iTunes" to successfully export playlist from iPod to iTunes. Step 1: Open the windows explorer or iExplorer on your PC. Step 2: Immediately the device is connected, the “device overview” will be displayed. To get started copying music, click “music”, to access the music, click “media library” through the side bar on the left. Step 3: You can check through or navigate your music and playlists in the left menu. Choose the songs you wish to copy to your computer. If you wish to copy multiple tracks, hold the “control” key while you select them. Step 4: At the lowest part of the media library, select the “transfer” button and a menu bar comes up. 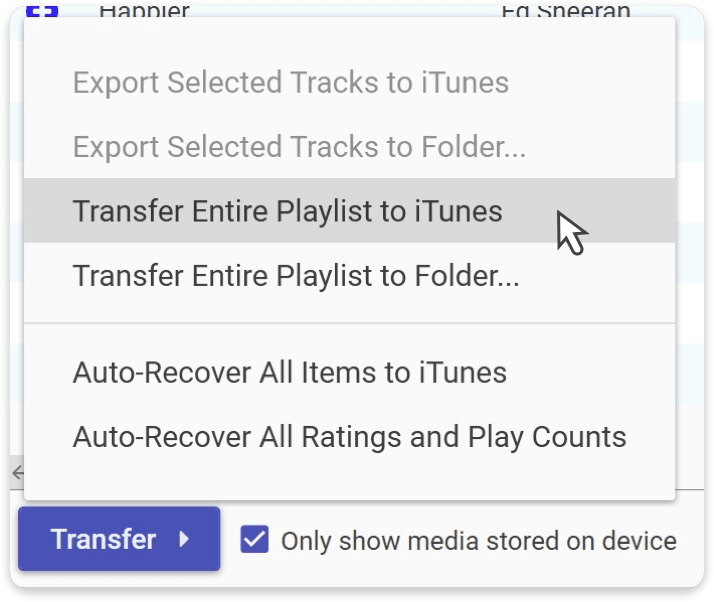 Click "Transfer Entire Playlist to iTunes". Once the iPod is connected to PC, iTunes will notify you to sync your device. Do not sync your device with the PC until you have transferred or copied the playlist file completely, if synced, it may result in the permanent loss of data from the device. Step 1: To get started, download, install and launch the iTunes. Step 2: Select the "File" at iTunes app. This will display a small menu. Step 3: Select “Library” > “Export playlist”. This command opens the file browser in order to choose the location to save the playlist file. Step 4: iTunes for Windows save the playlist file to the “system 32” folder by default. This is not an easy location to find it later. Change to an easy to access location either a document folder or preferably desktop. Step 5: Select the "Save as type" menu to get the format options. There are various options to pick from, and the format to be chosen depends on the usage of the playlist. Step 6: Pick a playlist file name and save it; usually by default, the playlist file will have the same name as it had on iTunes. Luckily, the playlist file name can be changed. 1. Before transferring music from your iPod to iTunes, be sure to check that the remaining storage space in the receiving device is sufficient. 2. Once the device is connected, iTunes will notify you to sync your device, select “Cancel” or “No”. Do not sync your device with the PC until you have transferred or copied the playlist file completely. 3. The iPod data transfer cable must be in good condition for an effective and safe transfer to occur. 4. The iTunes software must be in perfect condition. How to Back up iPod to iTunes Library without Erasing Data?